On Tuesday, May 5th at 8:00 pm ET / 7:00 pm CT / 6:00 pm MT and 7:30 pm PT (tape delayed) followed by a taped encore on Wednesday, May 6th, Dr. Laura Live! In Praise of Mom, a special LIVE in-theater event will show in more than 450 movie theaters nationwide. 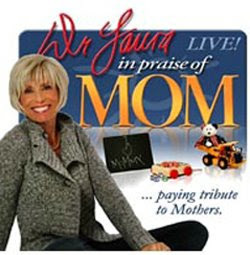 Simulcast from the Irvine Barclay Theatre on the University of California, Irvine campus, Dr. Laura Schlessinger will take a heartwarming, personal look at the joys and struggles of motherhood as she recounts her own life as a career woman turned stay-at-home mom in a live stage show. Featuring audio and video vignettes about moms from sons, daughters, grandchildren, grandparents, dads and moms, Dr. Laura will answer questions from audience members live at the Irvine Barclay Theatre in this uplifting and funny event. Tickets are available at Fandango.com.